This is our latest report on Shenango, Inc.’s quarterly compliance data, covering newly-available data from the second quarter of 2015. We review Shenango’s data every quarter to check its compliance with: 1) a limitation on the sulfur content of Shenango’s coke oven gas; 2) a limitation on visible emissions (in other words, smoke) from Shenango’s coke oven doors; 3) a limitation on density of the visible emissions from Shenango’s battery combustion stack which prohibits visible emissions with opacity greater than 60%; and 4) another limitation on visible emissions from Shenango’s battery combustion stack which prohibits visible emissions with opacity greater than 20% for more than three minutes during any one-hour period. Opacity is a measure of smoke’s density; smoke with an opacity of 60% blocks 60% of the light that would otherwise pass through it. Shenango violated the applicable limitation on the sulfur content of its coke oven gas twenty times in the second quarter of 2015. The number of violations in the second quarter is down from the twenty-nine violations that occurred in the first quarter of 2015, but is greater than the fourteen violations that occurred in the second quarter of 2014. Shenango must operate its battery of coke ovens so that smoke does not leak from more than five percent of its coke oven doors that are both in operation at a given time and not obscured from an inspector’s view. Shenango’s Title V Operating Permit requires it to inspect its door emissions at least once a day, and it is also subject to random inspections performed by the Allegheny County Health Department. Shenango’s inspectors detected no violations of the 5% door standard in the second quarter of 2015. In contrast, the Health Department’s inspectors appear to have found thirteen violations of that standard during the same time period, despite conducting fewer inspections. By way of further comparison, Shenango’s inspectors found no violations of this standard in the first quarter of 2015 and one violation in the second quarter of 2014, and ACHD’s inspectors found three violations of this standard in the first quarter of 2015 and one violation in the second quarter of 2014. 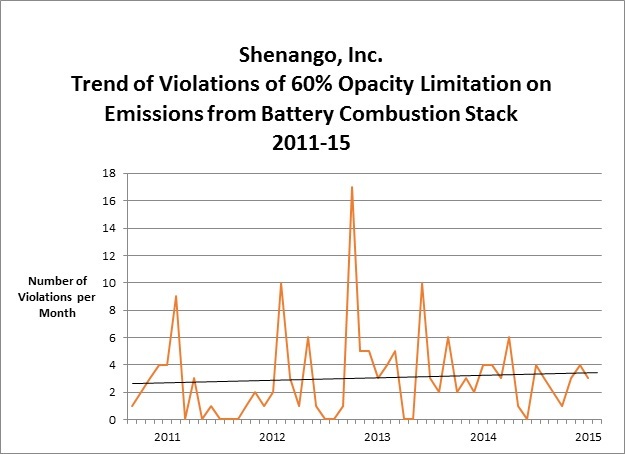 In the second quarter of 2015, Shenango violated the 60% combustion stack opacity standard ten times; Shenango violated that standard six times in the first quarter of 2015 and eight times in the second quarter of 2014. 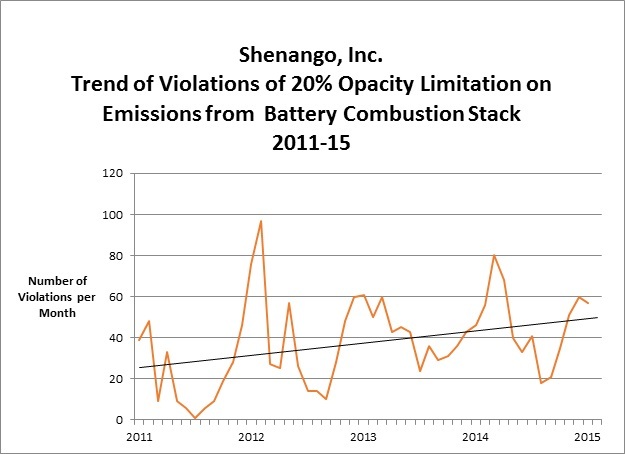 Shenango violated the 20% combustion stack opacity standard 168 times in the second quarter of 2015; Shenango violated that standard seventy-four times in the first quarter of 2015, and 125 times in the second quarter of 2014.